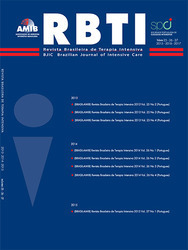 Revista Brasileira de Terapia Intensiva - ISSN 0103-507X is a quarterly publication of Associação de Medicina Intensiva Brasileira and of Sociedade Portuguesa de Cuidados Intensivos. It aims to publish relevant research focused on improving the care of critically ill patients based on discussion, distribution and promotion of evidence-based information to healthcare professionals involved in intensive care medicine. Articles including research reports, reviews, comments, case reports and letters to the Editor are published, involving all areas of knowledge related to intensive care of the critically ill patient.